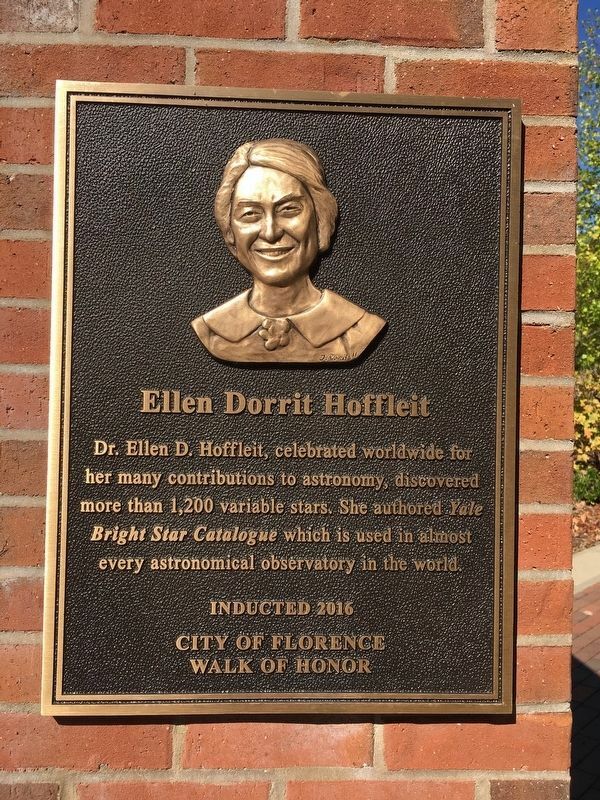 Dr. Ellen D. Hoffleit, celebrated worldwide for her many contributions to astronomy, discovered more than 1,200 variable stars. She authored Yale Bright Star Catalogue which is used in almost every astronomical observatory in the world. Erected 2016 by City of Florence. Location. 34° 48.404′ N, 87° 37.88′ W. Marker is in Florence, Alabama, in Lauderdale County. Marker can be reached from Hightower Place 0.3 miles south of Veterans Drive (Alabama Route 133). Touch for map. Located in River Heritage Park. Marker is at or near this postal address: 10 Hightower Place, Florence AL 35630, United States of America. Touch for directions. Other nearby markers. At least 8 other markers are within walking distance of this marker. General John Coffee (here, next to this marker); James Jackson (here, next to this marker); Kelton D. (Kelso) Herston (here, next to this marker); Lynn Middleton Sibley (here, next to this marker); Michael Hall Mobbs (here, next to this marker); Edward Stanley Robbins (here, next to this marker); William Burch (Billy) Reid (here, next to this marker); Natalie Chanin (a few steps from this marker). Touch for a list and map of all markers in Florence. More. Search the internet for Ellen Dorrit Hoffleit. Credits. This page was last revised on May 6, 2018. This page originally submitted on November 5, 2016, by Sandra Hughes of Killen, Usa. This page has been viewed 217 times since then and 2 times this year. Photo 1. submitted on November 5, 2016, by Sandra Hughes of Killen, Usa. • Bernard Fisher was the editor who published this page.